With this giant flip chart, you can teach comprehension to your whole class or small groups with great ease and impact. Or prop the chart up on an easel for students to use on their own! Two-page spreads show a strategy lesson on one side and on the other, a nonfiction or fiction passage with Robb’s think aloud highlighted. Finally, your students can see the kinds of thoughts a reader makes to puzzle the meaning of a word, visualize, and so on. 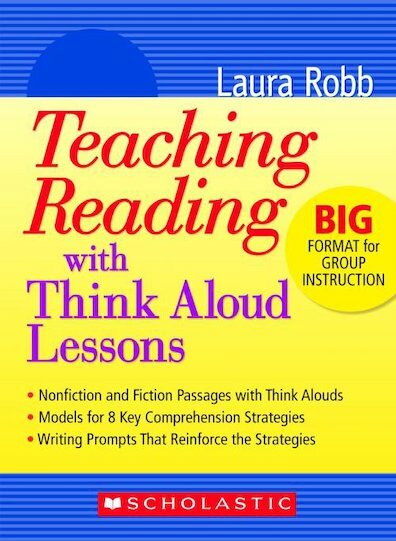 Includes lessons for 8 key strategies, including inferring, posing questions, making connections, discerning cause and effect, and more. Engaging journal writing prompts support students as they practice the strategies independently. For use with Grades 4 & Up.